Scale Up - how do you do it? 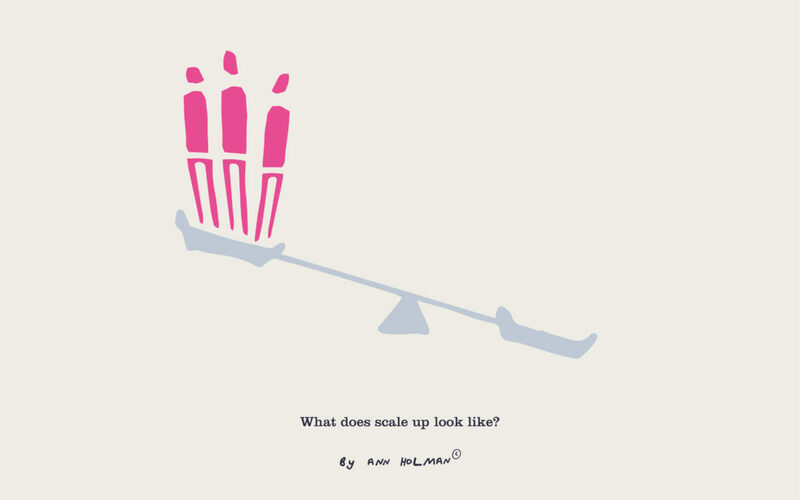 Scale up – how do you do it? Its a substantial report, reading just the executive summary will provide you with enough information if you don’t fancy a long read. However, as you might imagine, I have some thoughts too. I do believe one of the significant differences between a start up and an SME that is static in growth or suffers from ‘feast and famine’ is that they haven’t created and deployed a business model. In fact, its critical and a significant differentiator. Those struggling to scale typically haven’t described the method or means by which their company tries to capture value from its business. A business model may be based on many different aspects of a company, such as how it makes, distributes, prices or markets its products. The business model concentrates on value creation. It describes a company’s or organisation’s core strategy to generate economic value, normally in the form of revenue. Often this hasn’t changed or been refined since the company started. Right Team – Focus on building the right operational team. Hire upwards meaning people better than the founders with specialist skills set. Build a board of directors who can steer, guide, challenge the status quo and/or some of the decisions been made by the operational team. Scale ups have winning teams who are smart, intelligent and willing to change and adapt. The founding team need to know where their strengths are and serve those, understanding that they may need different leadership skills for scale up. Right offer – The product needs to be perfect for the market through a clear offering and proposition. Business modelling will help discover and create this through a delivery plan that grows customers, markets and reputation. Where is the value and how are you communicating that? The world is full of abundance and very little scarcity. Be very clear about how the business is capturing its value. Right investment – Scale up requires finance to be managed by an expert. Every scale up is clear about where its funding options are whether internal and external. They plan for it and build a presence that reflects that. If its internal funds they are allocated, ring fenced and managed. If its external, scale ups are clear about the approach they make to investors, seek out advice to prepare for it and move in the right circles. Right process & controls – Disciplined entrepreneurship is required at scale up. Building processes and moving controls away from the founders into systems needs to happen. Processes will hold your business together and need to be applied consistently. This is where you automate everything you can. Make processes robust by measuring their performance and continually learning and adapting as the business grows. Scale up requires a different mindset, skills set and behaviours that when in start up or SME mode.